100% Coffee – What Does It Mean? | Why Do Some Cans of Coffee Say 100% Coffee? 100% Coffee – What Does It Mean? When you see the words 100% Coffee on ground coffee sold in stores it means that there is a combination of different types of coffee beans. The blend is a mix of Robusta coffee beans and Arabica coffee beans. Well, the Robusta coffee beans are the cheaper, and very bitter, type of coffee bean. The Arabica coffee beans are much smoother, and more expensive. 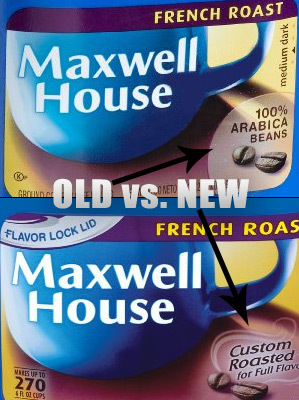 Many well know name brands have switched their labels to read 100% Coffee. Any brand that contains 100% Arabica will say so on the front of the can or package, as this is a key selling point in quality tasting coffee. Since the blend of Robusta and Arabica on the 100% coffee isn’t stated, the ratio can change. Prices have still gone up, as quality has gone down. Many brands are creating a new gourmet version of their coffee, at a higher price, and clearly stating 100% Arabica on the front. 100% Colombian is also a better quality coffee than the 100% coffee. WeGotCoffee recommends having a can of both 100% coffee and 100% Arabica. Start your day with a nice arabica coffee, and drink the 100% coffee during the day. This is a good way to keep your daily coffee costs down while still having good tasting coffee.